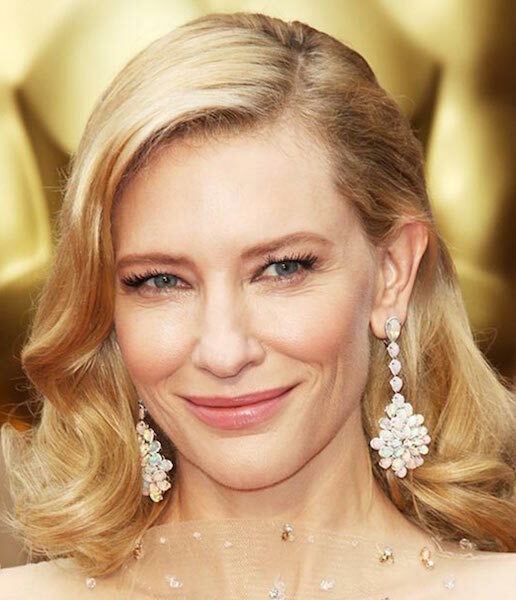 The ever-graceful Cate Blanchett is not solely about anti-aging, and we love her for that. Cate looks AMAZING, and we don’t need to mention her age, because beauty is not restricted to our 20s. Cate has taken very good care of her skin, as she puts it, to: “look as good as I can at the age I am,” instead of desperately trying to turn back the clock. She’s not obsessed with altering her appearance, instead focusing on working with what she’s got. A glorious complexion? And those cheekbones, to die for. Cate is full-disclosure when it comes to her skincare regimen, which is so refreshing, because, come on, water is NOT the end-all, be-all celeb secret to great skin. Cate’s got a pretty superb, and consistent skincare routine: exfoliate, moisturize, and sunscreen. She’s noted Dermalogica Daily Microfoliant ($54) and Neutrogena Ultra Sheer Sunscreen ($9) as her must-haves and has basically been moisturizing non-stop for the past 15 years! Cate is a SK-II spokesmodel, and regularly uses SK-II LXP Ultimate Revival Cream ($385) and Signs Eye Mask ($115), which she swears by. Judging by her appearance, that’s legitimate. She’s also confessed to donning sheet masks on long flights and believing in old-school beauty tips like cold spoons on eyes for de-puffing. Cate doesn’t like feeling dry, so powders are a no. But being in showbiz, makeup is a must, so she uses SK-II Facial Treatment Essence ($99) to set makeup and keep her skin hydrated, but not shiny, she says. Lining her eyes with white pencil to make them appear bigger and brighter is a tip she picked up from the pros. Her makeup artist, Morag Ross, is behind Blanchett’s onscreen transformations and regularly uses Suqqu Cream Foundation ($81) on Cate, painting her all glowy and radiant. Some of Cate’s makeup essentials: Kevyn Aucoin The Essential Mascara ($32) and Charlotte Tilbury K.I.S.S.I.N.G Lipstick ($34) in Hepburn Honey, for her signature red carpet pout. Cate steers away from harsh shampoos and conditioners and loves Philip Kingsley haircare products, especially Philip Kingsley Elasticizer ($78), a leave-in mask to strengthen her locks after too many blowouts. She’s loyal to Aussie-brand Evo Haze and uses their styling powder ($33) to perk up lifeless tresses. Claudia Mercado is a beauty-obsessed writer living in Long Beach, CA.